In a large food processor fitted with an “S” blade, combine the strawberries, lime juice, maple syrup, and water. 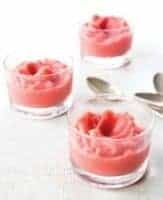 Process until the strawberries are completely broken down,which may take several minutes, creating a smooth and thick consistency similar to sorbet. Add more water, if needed, to achieve this smooth texture, and then serve immediately.